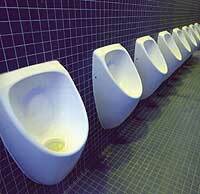 The new Wembley Stadium had to send back hundreds of urinals – because the maker’s name was on them. Manufacturer Armitage Shanks had supplied the urinals with its name on the front of them, reports the Mirror. But this is against Wembley Stadium’s strict non-advertising rules – introduced at the request of official sponsors. The embarrassing error only came to light after the toilets had arrived to be fitted at the giant complex. There are 2,618 toilets and urinals inside the stadium – more than any other building in the world.